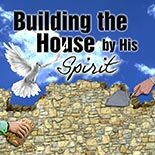 God is calling us to rebuild His House. This is a fulfillment of what the Kingdom is meant to be. It will take sacrifice. It will take being connected to God's Life and allowing Him to soften our hearts and rewire us. We will need to learn to respond to Jesus with a personal relationship in whatever is currently happening to us.